First of all, you need a class 5 cable (see specialized shops). 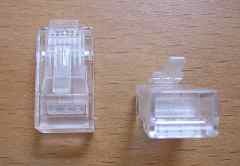 One can also shorten the cable included in the router package. 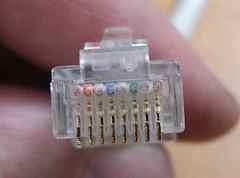 Ah yes: we need a special tool to crimp the RJ-45 connectors... let's say around 15 euros. 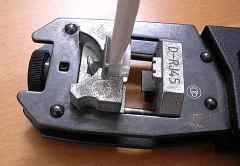 From the tool's hinge up to its handle: blades to denude the cable, the crimping metal pieces and a cutting area. 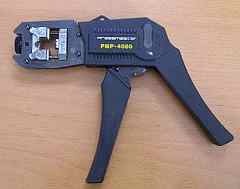 As far as the crimping only part of the job is concerned, I use this tool. 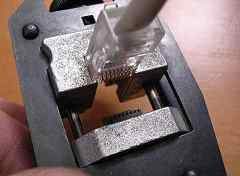 If the caps are used (optional), they, of course, have to be placed on the cable's ends before crimping the connectors! We see here the metallic pins which will be inserted in each of the cable's wires. 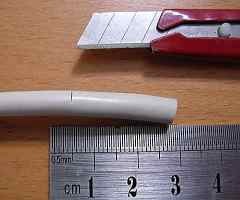 I do not use the cutting blades of the tool described above to remove the plastic coat which protect the cable's wires. I use a cutter and I make an incision at 2/3 cm from the cable's end. 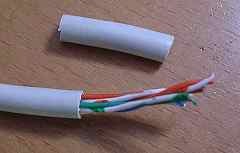 Doing this, I'm sure that the wires will not be damaged and that their length will be sufficient to untwist them! 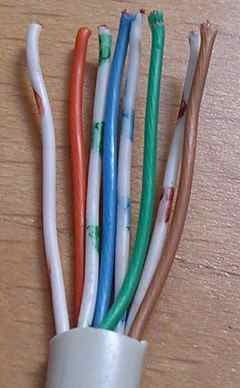 To build a "direct" cable, both cable's ends must be in this order. You see that, from the straight configuration, we permute "white/green" and "white/orange" on one hand , "orange" and "green" on the other hand . 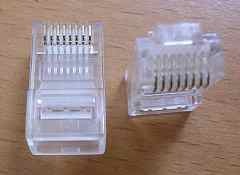 These two pairs are the ones which are used in a base-10 or base-100 or base 1000 connection. 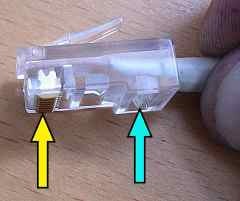 Other wires do not carry signal in the connection. 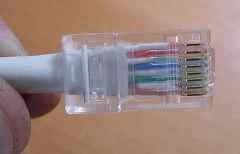 After cutting the wires, we insert them into the connector like this. ... up to the pins at the end of the connector! ... like this: the wires are well placed on. The yellow arrow points to the contacts which will go fixed into the the conducting parts, the blue one shows the plastic lug which will lock the conducting parts and their coat into the connector. And plug the connector into the crimping tool. Again, we check that the cable and the girdle are well placed before crimping them. The cable is ready...10 cm long as the webmaster of powerbook-fr.com, requiers it. 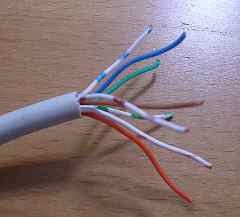 But this cable is quite rigid and as the network's components will be surimposed, a little gap between such home-made cables will be required to avoid problems.